Chinese delivery is always a quick weeknight dinner option, but why bother when you can make it yourself (and quickly at that), save a few dollars, as well as sneak in more vegetables than you would get otherwise? Although the recipe list may look a little on the longer side, the majority of the ingredients are fantastic pantry staples for an array of Asian dishes. Like a lot of people, my life is quite hectic – I know a thing or two about the need and want for quick, nutritious and flavorful dinner options. For more recipe ideas, be sure to visit my food blog. Place vermicelli noodles in a bowl, and then cover with boiling water. Let soak until tender, about 3-4 minutes. Using a colander drain the noodles, rinse with cold water, then drain again. Let the noodles air dry. On a plate, combine curry powder, grated ginger and salt “for the salmon”. Pat the salmon dry with paper towel, and place it flesh side down in the curry mixture. Coat the salmon evenly with the spice on the sides as well (except on the skin side). Heat 1 tbsp. oil in a nonstick fry pan over medium heat. When the oil is hot, place the salmon skin side down and cover. Cook for around 5 minutes, flip and then continue to cook until the salmon flakes with a fork, approximately 2-3 more minutes depending on thickness. In a medium-sized bowl, combine all ingredients “for the sauce” and set aside. Heat 2 tsp. oil in a wok over medium heat. Pour in the eggs, stirring every 10 seconds, breaking them into small pieces. Once just cooked, remove from the wok and set aside. Wipe the wok clean, return to medium-high heat, and add remaining 2 tbsp. of oil. Add the onion, garlic, ginger, and red and orange peppers and bamboo shoots. Cook for 1-2 minutes, then add 1 Tsp. curry powder. Add the noodles and the sauce, and toss together. Add the frozen peas, and the cooked egg and continue to toss until everything is well coated in sauce and is heated through, approximately 2 more minutes. 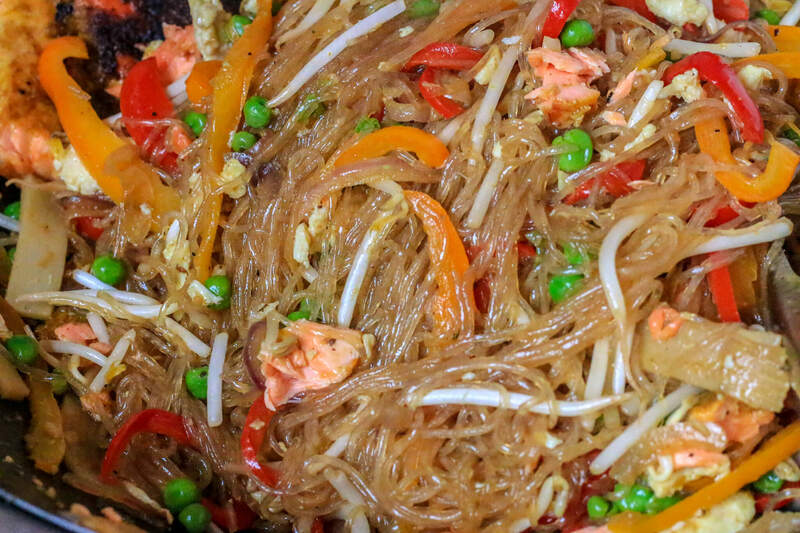 Flake the salmon with a fork into bite-sized pieces and add it to the noodles along with the bean sprouts. Serve while hot!